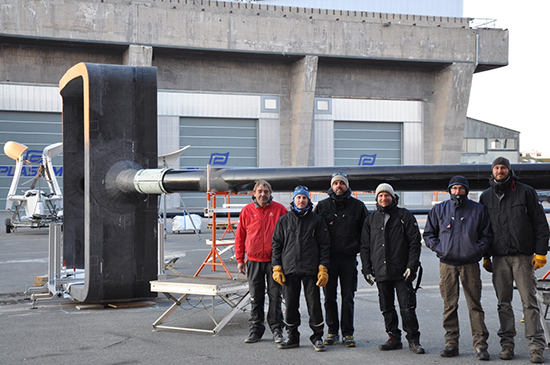 A team from LAPP was in Lorient from 26 February to 1st March to proceed with the assembly test of the arch prototype for CTA’s large telescopes. From 26 February to 1st March, several LAPP researchers, engineers and technicians went to Lorient, where LORIMA is based. This company led by Vincent Marsaudon is specialized in the manufacture of carbon mats for sailboats and is one of the world leaders in that field. LORIMA has been a partner of LAPP since 2011 and is responsible for the production of the elements of the guyed arch that will support the camera of CTA’s large telescopes. The LAPP team in front of the arch. CTA is the first observatory for very high energy gamma astronomy and consists of a network of several tens of telescopes. The telescopes, of three different sizes will be divided between two geographical sites : the North site in La Palma in the Canary Islands and the South site in Chile. The arch made in collaboration between the LAPP and LORIMA is intended for CTA’s largest telescopes. It is made of composite materials, consists of 6 tubes of 10 m in carbon fibre, surmounted by a frame in which is fixed the camera. This achievement, financially supported by the Brittany region and the General Council of Morbihan, is also co-financed by IN2P3 (National Institute of Nuclear Physics and Particle Physics) and LAPP. The production of the tubes and the frame supporting the camera has been spread over almost two years and comes to an end. An assembly test of the entire structure was made on the forecourt in front of the K1 bunker of the Keroman submarine base, where the company is based. This aimed to verify the good assembly of the different elements and the geometry of the structure. This also allowed the team to verify that the tooling designed for this installation works and allows the precise handling and positioning of the carbon fibre tubes. The assembly occurred in very good conditions despite the cold weather, and the result is very impressive. The CTA group at LAPP is currently finalizing the construction of the telescope control system, for both electronic and the informatics aspects. This system will be installed on the prototype of large telescopes from the middle of May. The group also took part in the integration of the camera control system of the prototype of large telescopes at our Spanish partners in Madrid. The next steps in LORIMA’s premises are finishing works, the painting of the whole and the fixing of the rails that will support the camera in its frame. The whole will then be shipped to the island of La Palma in the Canary Islands and reassembled on site in May 2018. The next key step for the CTA group at LAPP will be the final installation of the arch on the telescope in the middle of June 2018.